*Originally published as three separate reviews on the old E Street Film Society blog in March 2010, as part of the Sam Fuller Goes to War festival. Netflix and IMDB both list Fixed Bayonets! and The Steel Helmet as 1951 movies, but David Thomson’s The Biographical Dictionary of Film puts the release of Fixed Bayonets! in 1950. 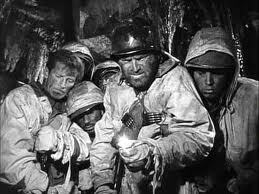 Whatever the case, it’s hard not to link these two early Sam Fuller war films together – both are about hardscrabble soldiers in the Korean War, using many of the same actors in similar roles, and both are intensely and even disturbingly realistic, despite the fact that they were obviously shot on soundstages. War movies are indigenous territory for a director who liked to describe film as a battlefield, but Fixed Bayonets! is a little more limited by its genre and commercial obligations. It’s about a terribly outnumbered platoon given a suicidal task – mask their battalion’s retreat by making the enemy think they haven’t even left. It doesn’t take long for the bullets to start flying, and as officers are picked off one by one, pressure starts to fall on the cowardly Cpl. Denno (Richard Basehart) to take command. The Cpl. Denno stuff is pretty standard-issue and predictable, but Fuller’s concept of war as inherently savage, nonsensical, brutal, pointless, inevitable, and only circumstantially heroic still rattles the bones. Fixed Bayonets! is an ensemble piece, but the most fascinating character is the lifer Sgt. Rock (Gene Evans). Rock has leadership and father figure qualities that endear him to the unit, but we also get the impression that he is half a sociopath, probably unable or unwilling to exist outside the theater of war. It takes a while for Fixed Bayonets! to build steam, but the second half is a landmine field of devastating setpieces, punctuated with the threat of sudden, overwhelming, and even self-inflicted violence. Gene Evans is also the star of The Steel Helmet, looking exactly the same and playing a less affable version of the Sgt. Rock character named Sgt. Zack. Evans was just 28 years old when he made these films, but he gives both characters the look and feel of a man who has survived several lifetimes. His Sgt. Zack is already a dead man walking by the end of the opening credits, which roll over his bullet-pierced helmet. Despite the fact that the credits for both Fixed Bayonets! and The Steel Helmet dedicate the films to factions of the U.S. Armed Forces, these movies are not about jingoism and cardboard heroes. There’s nothing explicitly political here except for the odd reference to “commie bastards,” and the films are mostly concerned with the incredibly difficult, unrewarding, dangerous, and thankless life of the soldier. All noble gestures are ultimately futile in The Steel Helmet, but so are ignoble gestures. A Japanese son of interned parents fights for the country that imprisoned his parents, but lazily resists the North Korean hostage’s anti-American rhetoric for reasons he can’t explain. So often in The Steel Helmet, the most heroic act is the most pointless, and the most cowardly act is the most meaningful, while the survivors are the ones most willing and able to deny their own humanity. The Korean War may just have been a timely backdrop, but it’s hard to imagine a film this savage existing anywhere other than the jungle. In many ways, The Big Red One feels like the culmination of Fixed Bayonets! 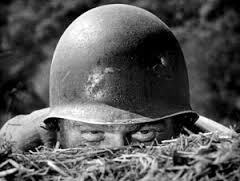 and The Steel Helmet, and this highly personal picture was Fuller’s white whale for several decades. 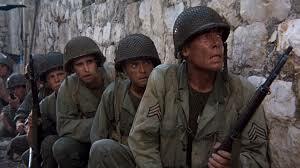 The Big Red One is more sprawling than the 1950’s war movies, yet no less focused on the psychological mechanics of a group of soldiers waiting for certain death. So why do I feel that The Big Red One, while fascinating and filled with bravura sequences, is the least of the three films? Curiously enough, the location shooting (as opposed to the soundstages of Fixed Bayonets! and The Steel Helmet) robs the film of a crucial sort of “realism”. The more claustrophobic sets of the earlier films gave them a raw, almost nightmarish intensity that is lacking in The Big Red One, which often struggles to make epic battles look like they weren’t shot on a shoestring. That said, The Big Red One is Sam Fuller on a grand scale, and the nearly three-hour-long “Reconstructed” version gives him ample space to indulge in his penchant for savage poetry, bizarre contradictions, and cruel coincidence. The Big Red One has one daring sequence after another, many trampling over the line between the sublime and the ridiculous. David Thomson said it best: “From the Civil War to the Vietnam War, Fuller has dealt with every major phase of American experience and returned with the conclusion that the world is a madhouse where ferocity alone survives.” In The Steel Helmet, Sgt. Zack technically “dies” before the film even begins, loses his mind in the final battle, but still marches on to the next fight – this, says Fuller, is the United States Infantry.